Inventors of the Netscape web browser are soon to introduce another browser that they claim will revolutionize web browsing. Marc Andreessen worked on a new browser called RockMelt. The browser is said to consolidate all the social networking sites and status updates onto one window enabling a user to keep updated thus increasing productivity. The browser allows interaction from many social sites including Facebook, Buzz, Twitter and also allows news monitoring to receive constant news updates. 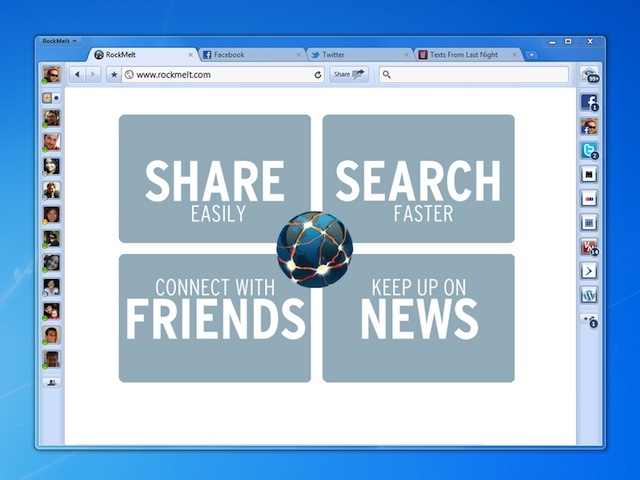 To use the RockMelt browser you would need to have a Facebook account. Once logged in from the Facebook account, your profile is read and is planted to the left of the browser. Updates can be posted directly from the website. Apart from these features, RockMelt claims to improve the speed and ease of search on the Internet. The search box brings results from Google directly into the box which is convenient. RockMelt also allows you to have your own preferences while you travel and use another machine where RockMelt is installed. This is done by storing all the user preferences on a remote server rather than your local hard drive. Check out the video. For more info you can visit the site here. Next Scientists Invent Invisibility Cloak!